The thing is that I finally found the chap in the above drawing but not in the Evangelium of Otto II but rather in the Codex Aureus of Echternach which dates to 1030-1050. This codex was probably shown to Henry III in 1046 which is known because it had a big effect on him and inspired Henry III to commission several very similar books so that narrows things down to about 1030-1043. In addition I tracked down several other illustrations in a French manuscript called The Saint-Sever Beatus which dates to c.a. 1038 according to the French national Library. That harmonises very well with the Codex Aureus time wise now doesn't it? However, before I found that out I rifled through two other manuscripts commonly known as the Evangelium of Otto III and found nothing but a few illustrations of men carrying round shields. This would indicate to me that the Kite shield was in common use in France and Germany by the 1030s so it is not unreasonable to hypothesise that the kite shield was invented/introduced into service somewhere in Germany or North Eastern France some time around the year 1010? Its been suggested that this shield evolved as an item of cavalry equipment but most of the people using it in the Saint-Sever Beatus are actually Infantry so I kind of doubt the cavalry theory. This brings me back to the period from 970-990 because it's also been suggested that these shields were introduced through influence from Byzantium which actually makes sense in the time frame from 970-990 since the mother of Otto III and wife of Otto II, Theophanu was a Byzantine princess. Theophanu was the daughter of a Byzantine general named Konstantin Sklero and she was a learned and intelligent woman from a military family and would have had no trouble using her family contacts to recruit military thinkers/advisors from the Byzantine army. Theophanu also had the respect of, and was listened to, by her husband Otto II. So if there ever was a time when Byzantine officers and military thinkers were likely to be able to influence the reform of a Western European military culture in a really big way it was German armies during Theophanu's reign as empress and later regent for her son Otto III. The true test of this hypothesis is finding a kite shield illustration from the 970-990. Can anybody point me to an illustration of a kite shield older than the 1030s? If no evidence of kite shields from the 970-990 can be found I'll have to take a look at other hypotheses, i.e. that the kite shield was introduced some around 1020 during some kind of reform initiated by Henry III during one of his many campaigns in Bohemia, Hungary, Lorraine and Germany it self. One thing is for damn sure, the kite shield was not a cavalry shield invented by the Normans specially for the battle of Hastings like one might conclude when reading various badly researched books on medieval warfare. This image is from a Byzantine version of the Iliad, found in manuscript BNN Mss.Gr.Z.454.Iliad (Venetus A). Manuscript Miniatures gives the date as circa 900-1000 AD. Interesting, according to Ian Heath's book "Byzantine armies 886-1118" the Byzantine army was already using 'triangular shields' (strange way to describe a kite shield) around 975 when the Sylloge Tacticorum was written (incidentally Otto II ascended the imperial throne in 973). According to Heath, depictions of kite shields began to appear in Byzantine art during the mid 10th century i.e. around 950 AD and were in use with both cavalry and infantry. The date range of 900-1000 fits what Heath said. Pity there don't seem to be any depictions from Western European art that are more recent than the 1030s. By the way, Heath might have borrowed "triangular shields" from the German, which refers to both kite shields and flat-top kites as "triangle shields". Regarding Georgian kite shields, “A large kite shield, with studs arranged in the form of a cross, rests on a spear embedded in the ground beside St George on a silver panel from Bochorma (dated hypothetically to the end of the 10th to mid-11th century).” He goes on to state however that care must be taken in attributing this representation to a Georgian workshop as opposed to Byzantine. All of the above can be found in Grotowski’s footnotes on pages 232-233. I have omitted the Greek characters given in two places in the original. The Kite shield was not a Norman invention that appeared in a puff of smoke at Duke Williams court just in time for the battle of Hastings. The kite shield was a Byzantine development, likely a modification of some older eastern equipment tradition. The form of kite shield that we see on the Bayeux tapestry, the Codex Aureus of Echternach and the Saint-Sever Beatus was introduced into service by the Byzantine army some time around 950 and was in fairly common use there by the 970s. The Codex Aureus of Echternach, the Saint-Sever Beatus and that Roda bible tell us this type of shield was probably introduced in Europe at least as early as 1010 and was in fairly widespread pan-European use from Germany through France to Spain by the 1040s and 50s at which time it was probably introduced to England and (no evidence that I can point to) popping up in Scandinavia as well. In both the Byzantine and the Ottonian/Salian empires kite shields were used for both infantry and cavalry from the beginning. It is possible these shields were Introduced through Byzantine influence, by the Ottonians as early as the 980s but so far there is not a shred of evidence for it. These shields may have been used by Scandinavians, who probably copied them from the Germans, as early as 1050 (?) but there is no evidence of it that I am a ware of at the moment. But the 'when' interests me just as much as the 'how' and 'where'. People keep saying this that or the other piece of equipment was adopted from the Byzantines but nobody hardly ever thinks about how. So how did the Byzantines exert this influence on the armies of the west? It could be as simple as some commander (German/French/Norman) picking one of these shields up off the battlefield after a skirmish with the Byzantines somewhere in Italy around the year 1000 and thought 'Nice! The tail of the shield protects my shin', and equipped all his men with copies. Kite shields could also have been introduced by western mercenaries returning home from service in Byzantium. Or kite shields could have been introduced through intellectual exchange with the Byzantines during the reign of the late Ottonian rulers as a result of their cultural, political and marriage connections with the Byzantines. Maybe Byzantine culture became fashionable at the late Ottonian court and burly knights and feudal lords in the western empire and other parts of Europe began stumble their way through Byzantine tactical manuals and copy the Byzantines military fashion in general. It may also have been some entirely different mechanism. I suppose we may never know. I should mention. Grotowski's conclusion, based upon the evidence available, is that "In view of the lack of clear evidence the origins of this shield remain unresolved" (p. 233). I am not sure whether Grotowski or the other authors are aware of the manuscript image that I posted above, which might provide further support for the Byzantine origins thesis. However, even in light of this evidence, trying to identify Byzantium as the origin of the kite shield remains problematic. Did it originate in Byzantium? Or is a Byzantine work of art simply the oldest known work to depict a kite shield? 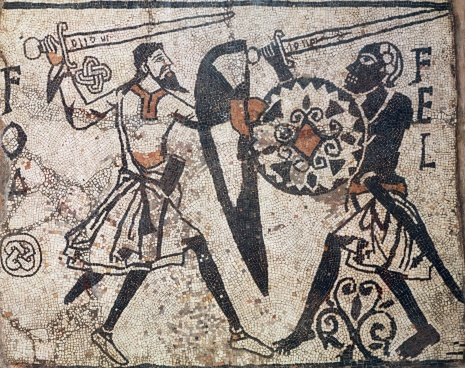 For that matter, how can we be confident that the shield is based upon an earlier eastern style? There's not enough evidence from the details about Louvre shield to say anything conclusive. Overall, the evidence for the origins of the kite shield is too scanty to try to draw conclusions. For that matter, what specific evidence, i.e. art does Heath provide for his circa 950 AD dating of the kite shield's appearance in Byzantine armies? From the concrete visual evidence we have so far, assuming the Manuscript Miniatures dating of 900-1000 is correct, we can at best say that the kite shield is in use some time during the 10th century in the Byzantine empire. Yet images of the manuscript on Pinterest claim that the text is from the 10th century, while the images are more likely from the 12th century. Obviously, a comment on Pinterest should be treated with caution, but it does provide reason to be cautious in accepting the Iliad image as dating to the 10th century. Much more concrete evidence is needed before anything solid can be said. The oldest western depictions are from Germany and France and date to the late 1030s and that the introduction of the kite shield in the West can at the moment be dated to the period 1025-1030? I admit the evidence is a bit slim but that's the way things look like at the moment. I also think there is a good chance of pushing these dates back with enough research. I think it's fairly safe to say that the kite shield somehow came to the west from Byzantium at some time after 1000. But more evidence would be good. As always I reserve the right to be colossally wrong and that I may revise those two points in the light of new evidence. As to Heath the way the text read he seemed to be saying that these shields were mentioned in the Sylloge Tacticorum (which dates to 950-975) so that is the next thing I'm going to research. There must be an online fachsmile of the Sylloge Tacticorum or some firmly dated Byzantine material depicting kite shields that date to the 10th century. If I can find such illustrations it would strengthen the idea of a Byzantine origin. Also, I'm pretty sure that there is a good chance of finding western illustrations of kite shields in use dating to at least the period between the years 1000 and 1025. 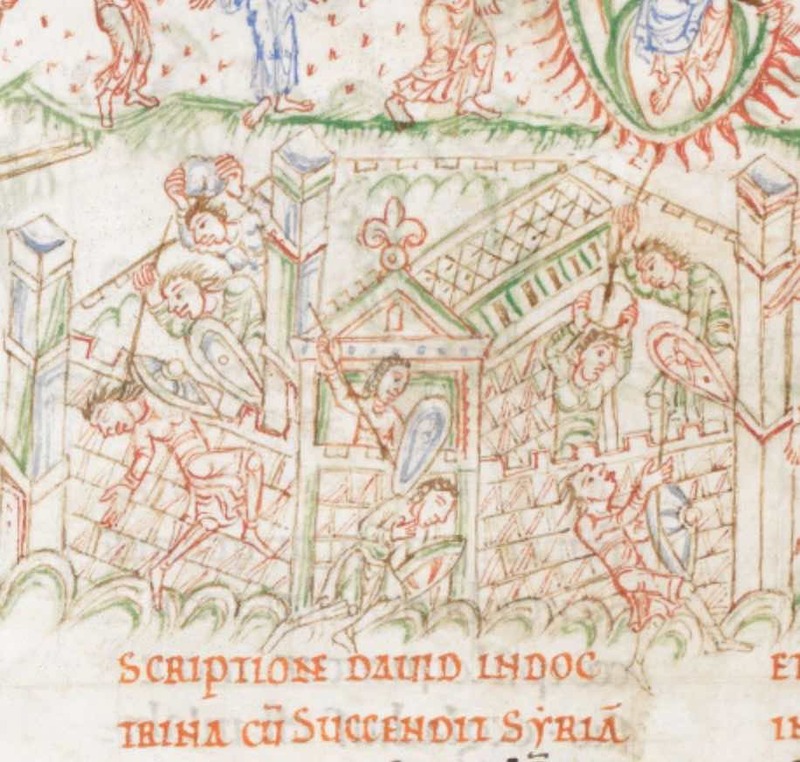 Of interest is this particular website, which gives many examples of 10th century illustrations: http://www.warfare.altervista.org/10C.htm. I could have missed something, but as best I could tell, there were no depictions of a kite shield in any of the images from the site, and Byzantium had a disproportionately large contribution of military illustrations when compared with Western Europe. This casts considerable doubt on the 10th century dating thesis in my mind; unless there are other examples of visual evidence that I am not aware of, why are there nearly no kite shields shown in Byzantine art? Rome or David Casket, Byzantine (date: c.a. 900AD) The those two guys on the lid of the casket seem to be the basis of many of the very early reconstructions in the Osprey books of byzantine skutati carrying kite shields. The image Craig posted (dated 900-1000) which is from a copy of the Iliad known as the Venetus A. It seems to confirm that kite shields were used by the byzantines during the 10th century. Still it's interesting how the other four guys in that image are carrying round shields. Psalter of Theodore of Caesarea (dated February 1066) Shows mostly round shields but also a few kite shields. Skylitzes Chronicle (date 1100-1200) Lots of kite shields in use by now. Assuming that the David Casket and the Venetus A are both correctly dated it would seem that some byzantine soldiers carried kite formed shields as early as 900 but judging by the pictorial material the round shield remained by far the most popular choice until after 1050. As far as I'm concerned none of this is conclusive. However, judiging by the Codex Aureus and the Saint-Sever Beatus kite shields seem to have been in fairly general use in Germany and France starting in the the first quarter of the 11th century while in Byzantium they were used in small numbers and only came really popular after 1066. Not much material to go by though. Fortifications In Wessex c. 800-1066 by Osprey Publishing depicts a scene taken from the Harley psalter (MS 603 British Library) showing men equipped with round shields attacking a city where the defenders carry kite shields. The text is dated to c. 1020. The kite shields are short and a further illustration from the same manuscript showing men wearing Carolingian style helmets probably confirms the date to no later than the early 11th century. No that is both helpful and very interesting. Do you mean the attached image? This manuscript is English and dates form the period 1010 to 1030. Which makes it the earliest western illustrations of kite shields so far. Interesting though how the round shields dominate the illustrations. Also interesting is the red lettering below the picture and how it mentions Syria. Could it be a caption? I don't read classical latin but it seems to be something about setting a scriptorium in Syria on fire. Scroll down to 'View: bindings' and click the image. Yes, that is the picture. I don't read Latin either but I presume its a biblical scene rather than a contemporary one. Then again I could be completely wrong. Yeah, I would have thought it is something biblical too. The Syria reference is just interesting because Basil II reconquered Syria in 1000 AD and it was subsequently lost in a sequence of revolts by 1045 so if this is a contemporary reference those defenders would be Byzantines and the Harley Psalter would have been written right in the middle of that conflict. That's not so unusual. If you take a look at the Bayeux tapestry many of the Saxon fyrd forces aren't even wearing helmets let alone armour. Just a shield, a spear and some kind of side arm. The shield is the poor man's armour. The text in the Harley Psalter is the beginning of Cassiodurus, Vol. 2, Commentary on Psalm 59. On the inscription of the title to David himself, for teaching. When he set fire to Mesopotamia in Syria, and to Syria of Soba. On the other hand I found another early kite shield depiction, a mosaic from the church of S. Maria Maggiore, Piemont, italy. Date is c.a. 1040. The round pommels are also interesting for such an early image. I would still be cautious and not count the Venetus A Iliad image without further information on the production of the images. The shield in this image is unambiguously a kite, and yet almost every other Byzantine image from the 10th century shows round shields, save for the David Casket which shows a shield quite different in style from a classical kite. This detail alone means that the image should be treated with considerable caution. about shields like these in the Liber ad Honorem Augusti manuscript? http://manuscriptminiatures.com/3966/11577/. Determining what, precisely, counts as a kite shield is of importance if we are to evaluate evidence. I think the safest statement we can offer so far is that the classical or "true" kite shield, with the long "tail", developed in the first few decades of the 11th century but only became widespread during the latter half of the century, becoming the shield of choice in most places during the 12th. I would still be cautious and not count the Venetus A Iliad image without further information on the production of the images. The shield in this image is unambiguously a kite, and yet almost every other Byzantine image from the 10th century shows round shields, save for the David Casket which shows a shield quite different in style from a classical kite. about shields like these in the Liber ad Honorem Augusti manuscript?http://manuscriptminiatures.com/3966/11577/. Determining what, precisely, counts as a kite shield is of importance if we are to evaluate evidence. The way things look to me at the moment, the only thing I'm comfortable saying is that by the 1030s to early 1040s kite shields were in fairly widespread use in Germany and France. They were also known in Italy by that time. The Harley psalter demonstrates that the kite shield was at least know in Britain by 1020-1030 but judging by the preponderance of round shields in the Harley psalter Kite shields do not seem to have been the norm in that country. I'm going to say that based on the evidence I have now the kite shield was introduced (or possibly even invented) in the west in the first two decades after the year 1000 somewhere in Germany or France and then exploded onto the military scene becoming quite popular by the mid to late 1030s. Warning:wild speculation to follow, the kite shield may even have been introduced in Byzantium by western, that is French, German and English mercenaries in the period form 1050 to 1070.